The capital city of India is one of lovely places for tourists. It can be split into two parts – Old Delhi and New Delhi. Old Delhi was the capital of India before the British took over to construct a new city that came to be known as New Delhi eventually. The architecture of Delhi has undergone countless modifications over the years due to the felling of many constructions and renovation works. Delhi is best known for the monuments that you get to see reminding you of the ancient period. Another striking aspect of Delhi is the diverse cultures that you get to see along the length and breadth of the city. Apart from all this, all the major political activities of the country have their base here as it is the National Capital. Let us have a look at some of the most popular tourist spots in and around Delhi. This is probably the most famous among the monuments at Delhi right now. It is the Official Residence of the Honorable President of India. The monument was constructed during the British Rule and used to be the residence of the Viceroy of India during those times. The construction took a mammoth 19 years to finish as it started in 1911 and was completed only by 1930. The design of the building was done by Edwin Lutyens. On the western side of the Rashtrapati Bhavan, you have the Mughal Gardens which are exceptionally beautiful and provide a lovely view. The monument is open to the public during spring time every year. 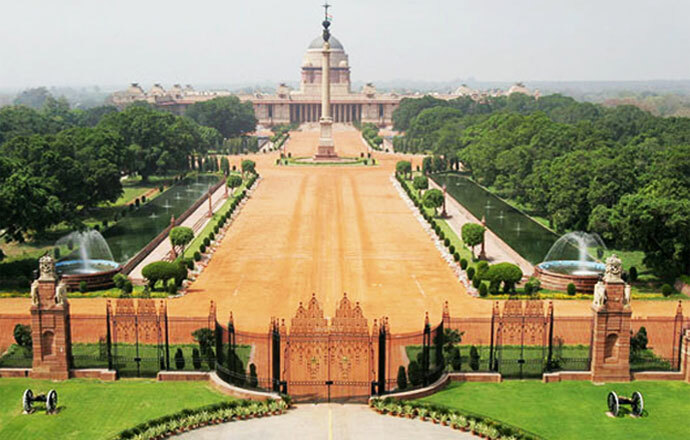 Tourists have the option to visit Rashtrapati Bhavan and Mughal Gardens at a registration fee of Rs.25. If you are coming in a big group consisting of more than 30 members, discounts can be availed while children below the age of 12 are exempted from registration fee. 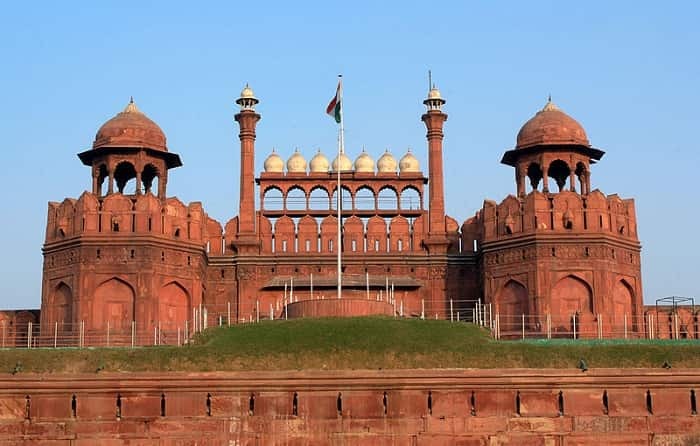 Another milestone of Delhi is the Red Fort which is a historical architecture. It is a massive monument that is made up of red sandstone. It extends over a whopping 2 km. It has a height difference of 18 m on the side of the river to the 33 m on the side of the city. Construction of this monument started in 1638 during the times of Mughal Emperor Shah Jahan and was completed in 10 years in 1648. Inside the Red Fort, there are a wide array of buildings namely the Pearl Mosque, Drum House, Hall of Public Audiences, European and Indian art forms etc. This masterpiece monument is a must-watch for every tourist visiting Delhi. It is a religious place that is located in Old Delhi. 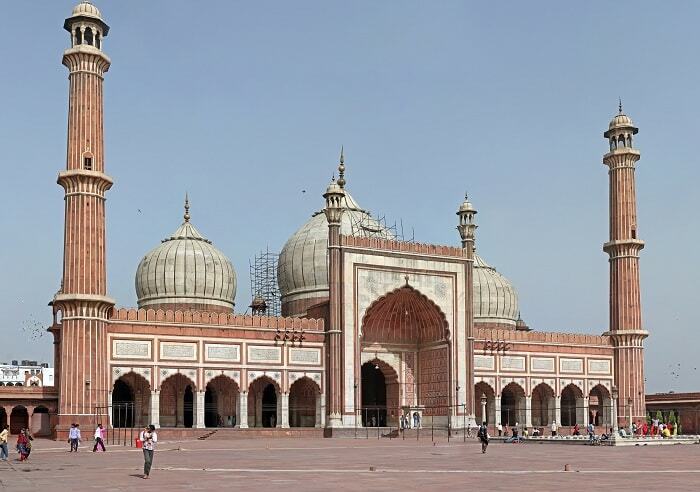 It is one of the most known Mosques in Delhi and is considered a must-visit place especially for Muslims. The architecture of Jama Masjid is exceptional and the stunning fact is that the area of the Mosque can accommodate 25000 people at a time which is incredible! The construction of the Mosque started in 1644 and was completed within 14 years by 1658. A total of 5000 people were at work for completing the construction. There are three gateways present along with four angle towers. Another stunning feature is the presence of minarets that are at a height of 40 m. They are made up of a mixture of strips of red sandstone and white marble. There is generally no entrance fee here but you shall have to take a ticket of Rs.200 for taking pictures inside the Mosque. This is another historical monument that is recommended to tourists visiting Delhi. It is situated at Connaught Place on Sansad Marg. This construction was one of the two observatories belonging to the great Maharaja Jai Singh. He ruled over Jaipur and this monument was constructed in the year 1725. The presence of a huge sundial is what dominates this structure and it is called as The Prince of Dials. There are several other instruments that can be seen in this observatory that help to find the paths of heavenly bodies. They can also be used for predicting eclipses. Construction started in 1724 and was completed in 1725. 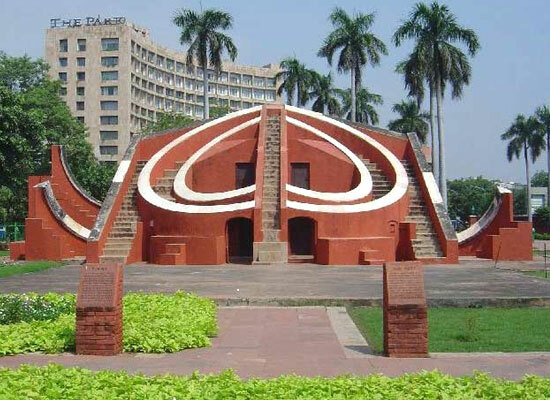 Jantar Mantar is known worldwide as an observatory that helps in analyzing Astronomy. There are several instruments available that helps to measure the graph of the astronomical universe as well. 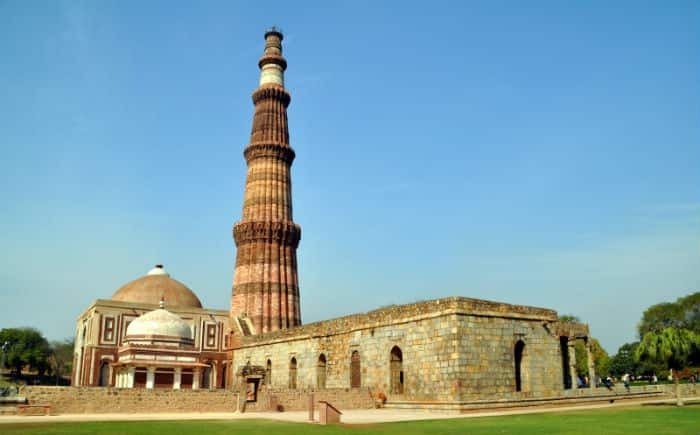 Another hugely popular historical monument of Delhi is the Qutub Minar. Another feature of Qutub Minar is the fact that it is the world’s tallest minaret made solely up of bricks that have a height of 72.5 m! The construction started during the time of Delhi’s first Muslim Ruler Qutub-ud-din-Aibak in the year 1193. At that point of time, only a basement was made. His successor who was also his son-in-law was the one who initiated the addition of three more towers to the construction. The biggest significance of the Qutub Minar is that it remains among the earliest examples of the existence of Indo-Islamic architecture. There are some other structures that surround the Qutub Minar. As a whole, the area is called as the Qutub Complex. Delhi is full of monuments – be it historical or art related. 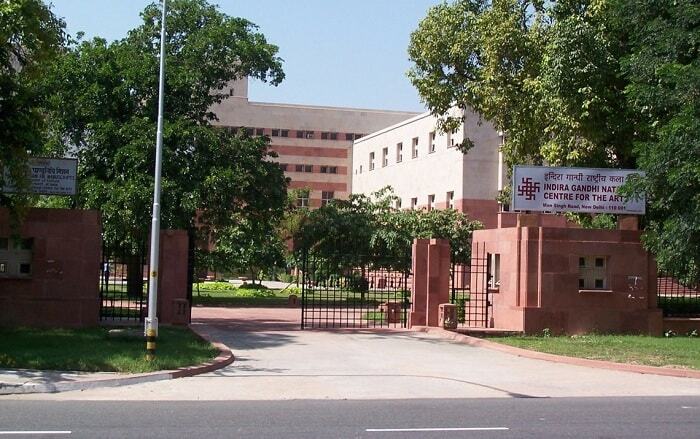 Another such monument related to the arts section is the Indira Gandhi National Centre. This is an institution that is financed mainly by the Government of India with sole motive of promoting as well as preserving art in its purest forms. It was inaugurated in the year 1987 by the then Prime Minister of India, Shri Rajiv Gandhi in memory of his mother Indira Gandhi who was a former Prime Minister as well. The Bahai Temple is another widely known Religious Monument present in Delhi. It is commonly known as the Lotus Temple due to its architecture that gives it a lotus shape. This temple is situated in the southern part of Delhi. It was designed in the year 1986 by an ace architect of Iranian-Canadian origin named Fariborz Sahba. 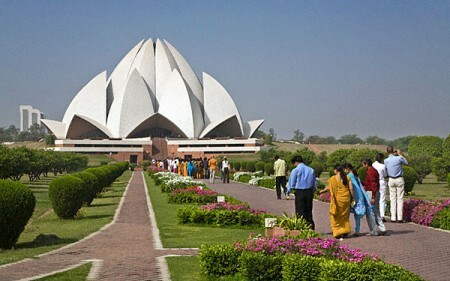 The prominent feature of the Lotus Temple is the presence of 27 white petals. It is a very popular center of attraction among tourists while also having won several accolades in architecture as well as being featured in top magazines worldwide. October to March is the best phase of the year to visit. While there are many places in Delhi for the lovers of history and art, science is another field where you can see structures or monuments as well. 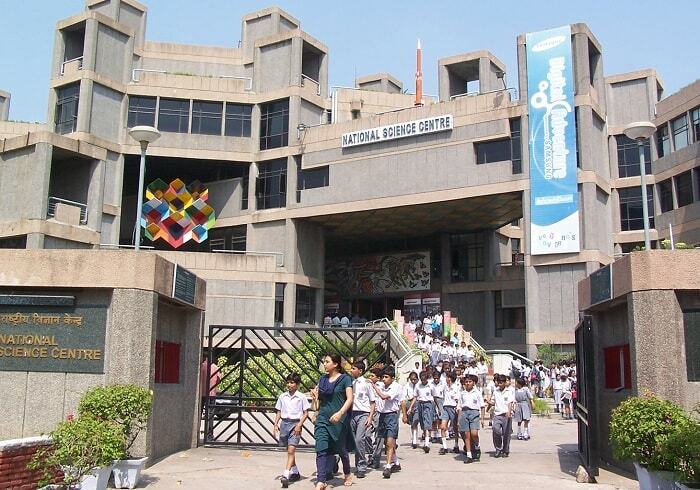 The National Science Centre is one such place that is totally devoted to lovers of the Science stream. It is basically a museum for science with the main intention of educating the people about the various aspects of Science and making them aware of the scope of science so that more people take it up in their lives either as a hobby or career. Probably one historical monument that should be right up there in your priority list as a tourist visiting Delhi. It is a historical monument that was constructed in memory of the countless Indian soldiers who laid down their lives during the First World War. The Indian soldiers were part of the British Army that had gone on war in what was one of the most brutal Wars in history. 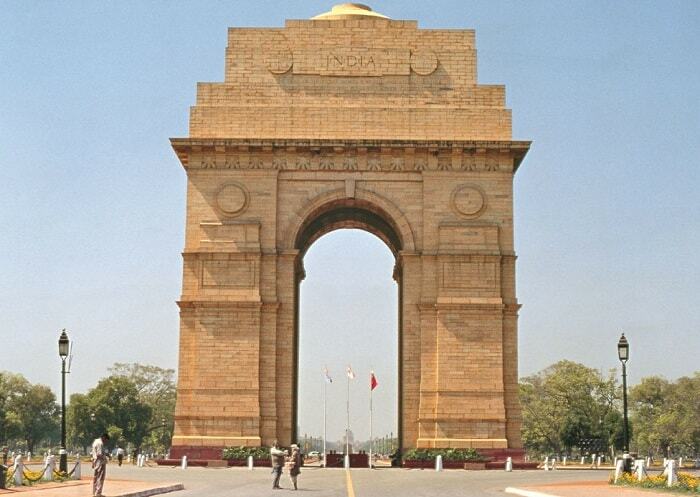 India Gate was designed by Edward Lutyens and was completed in 10 years. The basic architectural structure of India Gate consists of a 42 m high triumphal arch. 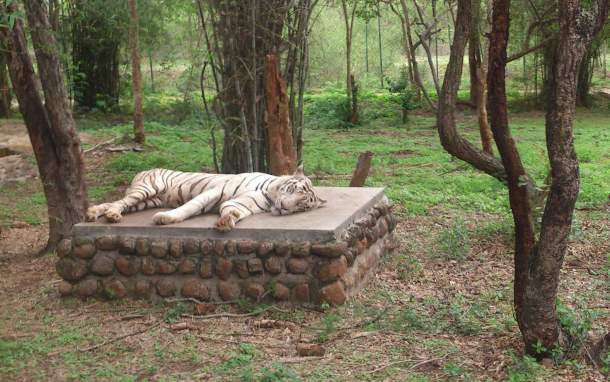 Wild life is something that excites every tourist irrespective of his/her origins. Right from our childhood, we are always fascinated at viewing animals at the zoos. The National Zoological Park is a must-watch tourist spot in Delhi for the wide range of animal life that can be spotted there. It is a place that every Delhi it has visited at least once in their lives. While you make plans to visit Delhi, do jot down this place in your list of tourist spots that you are wishing to visit. Overall, Delhi is one of the finest places in India for tourists. There is a wide range of places for you to visit in each possible stream giving you the best tourism experience. The diversity of culture as mentioned earlier makes Delhi a class apart from the rest.